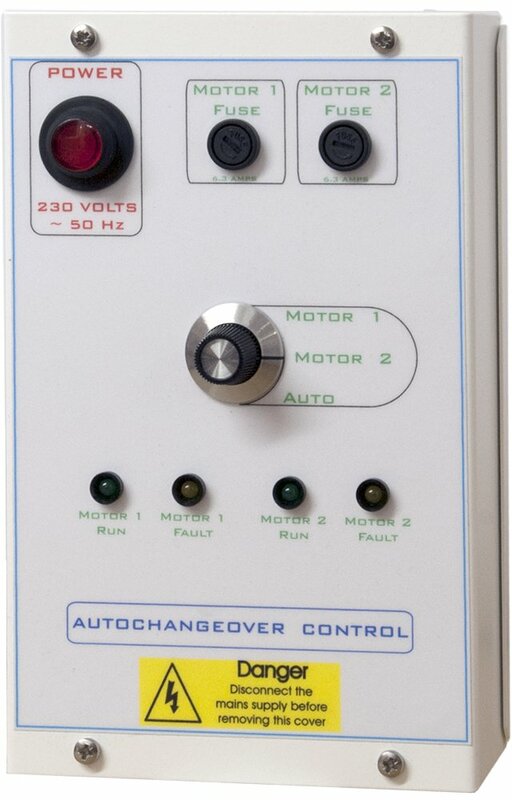 Our single phase auto changeover control panel is designed to control single phase motors up to 6.3amps. We can also build single phase auto changeover panels with a higher rating in the style of our three phase auto changeover panels. The panels are designed to be easily connected to external speed controls, remote time clocks etc. 1. To automatically change from one motor to another in the event of a fault condition. to standby in a fault condition. A double pole switch with neon is provided to switch the unit ON-OFF, the neon in the switch is illuminated in the ON position. by switching OFF and back ON. with a volt free contact which makes in a fault situation. thermostat, humidity switch or any other suitable device. seconds and will prevent spurious fault switching. Only after a fault condition has been monitored for 20 seconds will the standby motor be switched on. load current of 6 AMPS each. A fuse is provided for each motor and is replaceable from the front of the controller. For more information on any of our standard control panels or to enquire about your individual requirements, request a quote or contact us by phone or email. Sarum also manufactures an EC fan version of our single phase auto changeover controller fitted with a speed control pot with panel facia control. The 3 phase version is also available manufactured to customer specifications that can include inverter speed controls, one per fan or one inverter shared between fans. Have a question about Sarum Auto Changeover Controls? Please fill out the form below and we will get back to you.